Have you ever walked into a pizzeria and tried a slice of their delicious salad pizzas around lunchtime?? If you haven't I urge you to give one a try next time. 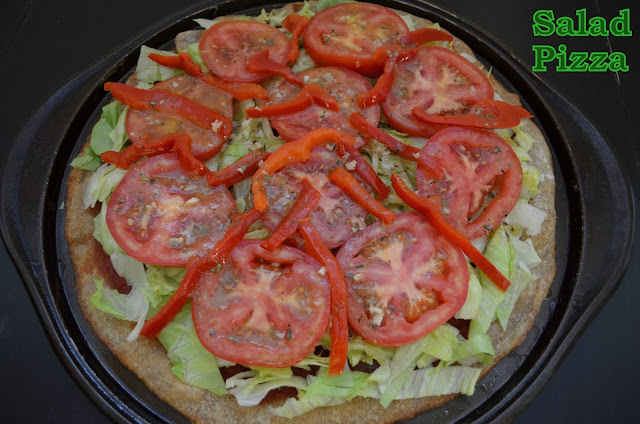 I like these specialty slices because the crisp lettuce, fresh juicy tomatoes and sweet roasted red peppers on top of the crispy pizza crust with a garlicky homemade Italian dressing give it the perfect combination to feel like you are having both pizza and salad. I don't know about you but here in NJ this type of cold cheese free pizza is very popular even if you have to eat it with a fork and knife. I tried to model my own version of salad pizza after my favorite slice which comes from La Casa in Westfield, NJ and I think I really nailed it!! Preheat your oven to 425 F. Spray your pan with Pam and set aside. Roll your pizza dough out on a lightly floured surface. Place 1/2 in thick pizza dough in pan stretching it to fit. Cover with tomato sauce, then sprinkle with Italian seasoning. Bake 15-18 minutes till sauce is bubbling and crust is crisp and light brown. While the pizza is baking you can make the Italian dressing so it has some time for the flavors to combine. In a mason jar or salad dressing container combine all of the ingredients for the dressing (minced or pressed garlic, red wine vinegar, olive oil, salt, pepper and oregano). Close the container and give it a few good shakes. Allow it to sit for a bit than shake it again. When your pizza is cooling you can prepare your toppings. Wash and slice the iceberg lettuce into thin strips, slice the tomato, drain and slice the roasted red pepper into strips and thinly slice the raw onion if you are choosing to use it. When it is ready spread the lettuce all over the bottom in a decent layer covering all of the sauce, arrange your sliced tomato nicely on top then place your roasted red pepper strips around and in between all of the tomato. If you are using the raw onion you can place that on top as well. Give your Italian dressing another few good shakes and slowly pour about half of what you made on top of the pizza. Be careful not to over dress it as it will make the pizza soggy. I suggest eating this pizza immediately as it taste the best fresh and cold. If you choose to save the left overs, separate each piece with foil so the dressing doesn't make the crust soggy.